Photo of Obama with pint-sized superhero results in collective "awwwww"
(CNN) -- Two very different images captivated Internet viewers on Wednesday. First, a YouTube video of an eagle snatching up a toddler captivated millions of viewers, some of whom may not have immediately realized it was fake. Uploaded on Tuesday, the clip shows a golden eagle swooping out of the sky to grab an infant in its talons, then dropping the child seconds later. Despite broad and immediate skepticism of its authenticity, it had more than 5 million views by Wednesday evening. Comments on YouTube and the school's website were mixed. Sandra Bauer wrote, "... it would be a good idea to post some links to raptor rescue centres. This video will undoubtedly spawn irrational fear of eagles and others." A YouTube commenter, DJ Mykee, had a more light-hearted view: "KIDNAPPING CHILDREN IS﻿ ILL-EAGLE." Considering that the bald eagle is a national symbol of U.S., maybe it's fitting that the day's other viral imagery involved President Barack Obama. Time's website published a behind-the-scenes gallery of photos of Obama, snapped by White House photographer Pete Souza, to accompany the magazine naming Obama its Person of the Year. 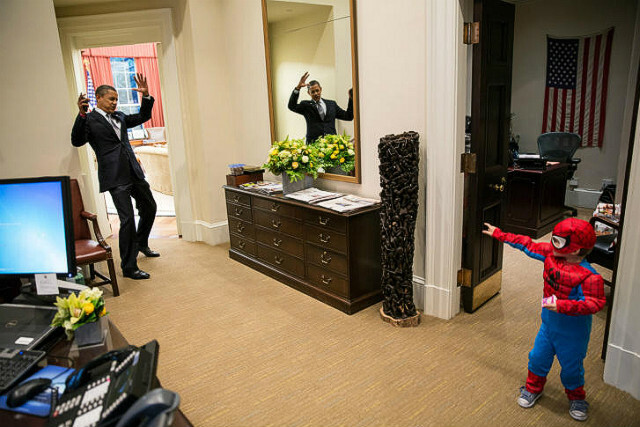 One of them showed Obama at the White House, pretending to be caught in a pint-sized Spider-Man's web. President Barack Obama plays with a staffer's son on October 26. Although Time's choice of Obama over Pakistani schoolgirl activist Malala Yousafzai was controversial to some, Twitter was immediately captivated by the Spider-Man image. Obama posted the photo Wednesday morning on his Twitter account, and by the evening it had been retweeted more than 9,200 times. @michael_lobster tweeted, "I really hope that this is the plot of the new Spider-Man movie." The tone on Facebook was decidedly less enthusiastic. "Am I the only one who is skeptical of all these cute kid picture situations the President seems to find himself in? Authentic or staged?" wrote Sunny Blankinship. "I don't know about politics, but I can tell you one thing," wrote Kaldrenon on the social platform Reddit. "I want to be the kind of father Obama is, and treat all kids this well." "The photo," wrote Gawker, "does a better job of cementing the correctness of Time's selection than any 10,000-word profile can."